While Trump is being referred to as "the devil we don't know," he still remains a viable alternative to Hillary Clinton and her neocon supporters, who are itching for escalating conflicts across the globe, US-based journalist and editor-in-chief of News Junkie Post Gilbert Mercier told Sputnik. American voters have found themselves caught between the devil and the deep blue sea, Gilbert Mercier, a US-based French journalist, author and editor-in-chief of News Junkie Post, underscores. However, according to the journalist, while weighing the pros and cons of selecting between the two competing candidates, one should ask oneself which of the "two evils" will most likely drag the country into a disastrous global conflict. In his interview with Sputnik, Mercier shed light on the balance of power in Washington and the driving forces behind the candidates' campaigns. What forces are supporting Democratic presidential nominee Hillary Clinton and her opponent, Republican nominee Donald Trump, and are the contradictions between the two camps really deep? "Yes, the contradictions are very deep," the journalist underscored. "The right-wing forces backing Trump, largely because of his running mate [Michael] Pence and their aversion to Hillary Clinton, are the evangelical Christians. They represent a strong voting block of about 10 percent overall nationwide, and much more in rural areas. When you look at a map of the electoral divide in the United States, it is rather fascinating both sociologically and historically. It is as if the mid-19th century Civil War was never lost or won. The old Confederate south will go to Donald Trump," Mercier told Sputnik. The author explained that beside this specific Christian vote for Trump, other people like him because he is considered to be an anti-establishment candidate. "Many will vote for Trump as a form of protest against a political class they despise. One could say, especially considering that this election cycle has become such an exercise in sleaze, depravity and joyful roll in the gutter, that a vote for Trump is a f**k you vote," the author emphasized. For her part, Hillary Clinton is supported by American neoconservatives, a rarefied urban elite, in majority Jewish, Mercier continued. "Since the launch of the so-called Project for the New American Century in 1997, they have been the driving force behind almost every foreign policy decision made by US governments, either Republican or Democrat. Victoria Nuland, the person who masterminded the destabilization of Ukraine from the State Department, is the wife of one of the neocon founding fathers: Robert Kagan," he stressed. "You will not find neocons with mud on their shoes minding their fields in Alabama," Mercier remarked, "Their natural milieu are the corridors of powers in Washington DC, organizations like AIPAC, the Council on Foreign Relations, American Enterprise Institute, and other think-tanks; or institutions like the Pentagon, the State Department, and the CIA." The journalist underscored that "neocons are, by definition, the ideologues and puppet masters of the empire behind the notion of US exceptionalism and uncontested global hegemony." "In this regard, Hillary Clinton is, very much, a neocon," he pointed out. Will Donald Trump Make a Step Towards Russia, if Elected? While Clinton is using the Russia card to vilify her competitor, as well as other politicians and pundits standing in her way, Trump, for his part, has repeatedly signaled that he will establish working relations with Russia, if he were elected the US leader. Will Trump really seek a compromise with Russia on Syria and Ukraine, if elected, or is it part of his campaign rhetoric? "It is hard to have an accurate read on this. This might sound cynical, but the real question is: which group of people would run Trump if he was elected?" Mercier asked rhetorically. "For example, from day one of his presidency Barack Obama was surrounded and run by Clinton's crew, whom I call Clintonites. Therefore, in many ways, Obama's first and second terms were really Clinton's third and fourth term," the author noted. Mercier called attention to the fact that Trump would like to be perceived as a new Ronald Reagan. But this does not fare well as an indication of the real power he might want to exercise, according to the journalist. "The man in power during the Reagan era was George Bush Sr. [George H.W. Bush], while the former actor was just a figure head reading speeches that he did not write. Ultimately, if Trump had the intention to assert his independence from Washington's usual suspects, and truly assume power, it would likely become extremely hazardous to his health," he suggested. As American academic Stephen M. Walt noted in his August column for Chicago Tribune, Trump highlights "three sensible things" about US foreign policy: first, that the US should pursue its national interests in the first place; second, that many US allies are "free-riding" on American protection; third, that Trump claims to be opposed to "dumb" wars. However, Mercier expressed his doubts regarding Trump's willingness to profoundly change Washington's foreign policy course. "In regard to foreign policy, there is, unfortunately, not much departure from Trump about the guiding precept of US global hegemony, by military force in most cases. A Trump presidency would not end the global Monroe Doctrine, which has been the corner stone of US foreign policy since the collapse of the Soviet Union," the author pointed out. 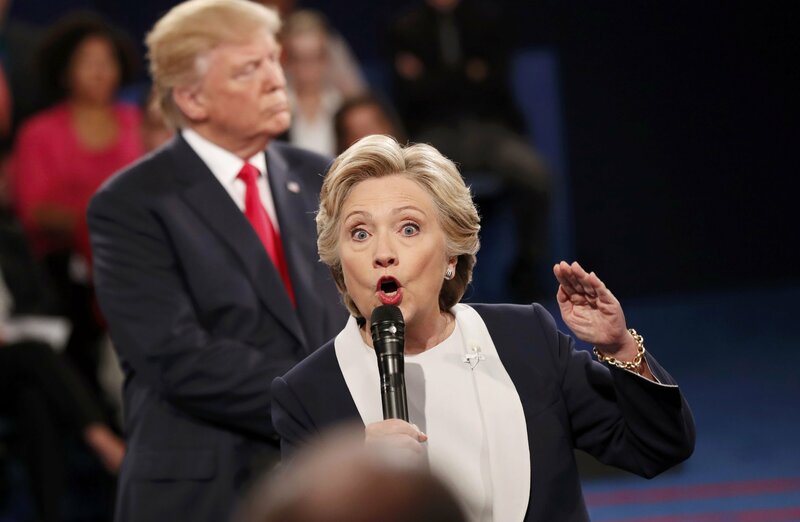 "The somewhat moronic comments Trump made during the first debate with Clinton should be alarming when he mentioned that countries such as Germany, Japan and South-Korea, which are arguably occupied by US troops and have been since World War II and the 1950s for Korea, should pay the US for their own occupation. This is in line with the tribute paid to Rome by oppressed nations that the Roman Empire had invaded," Mercier stressed. "That said, however, there is an unknown factor with Trump, and paradoxically it is a good thing," he added. Referring to his recent article "Clinton vs Trump: Lesser of Two Evils or The Devil You Know," Mercier stressed that in the context of foreign policy, "Donald Trump is the devil we don't really know." On the other hand, "the devil we know, Hillary Clinton, seems to act as if she already has won the election and is directing US foreign policies in the worst possible way. The no-fly-zone over Syria is a Clinton idea, which is of course designed to put the US and Russia on a collision course," he warned, referring to the fact that Clinton specifically endorsed regime change operations in Libya, Syria and Ukraine. "None of the US candidates are good options, but Clinton certainly constitutes a clear and present danger to world peace," Mercier stressed. In light of this Donald Trump represents a viable alternative to Clinton, since a potential direct conflict between the US and Russia is obviously not on his agenda.